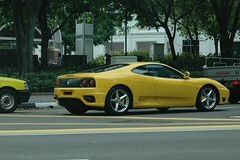 A couple of days later, I saw a red Spider 360 convertible on the same road, but didn't have the cam with me. I saw a Lamborghini in Mumbai! Haha, yes I'd read that one before :) I saw the same Lamborghini twice here..but didn't have the cam with me. There is a Ferrari in Bangalore too. Same color but a different (and older) model! So you should come to Koregaon Park in Pune you get your 'daily dose' + 'healthy mix' right from Lamborghini thru Ferrari thru Jaguar thru Hummers thru Maybach thru ............ gaaaah !